Let's be honest, most of us will never get to live in a crazy futuristic home like the Jetsons, but that doesn't mean we can't strive for a few of the simple luxuries. To that end, Doug Gregory is on track to make his living room smarter than the bridge of the USS Enterprise, all with a few electronic controllers and extensive use of Tasker. There's no way around it, you really need to see the video for this one. Not counting home theater equipment and the Nexus 4, Doug was able to put everything together for less than $300, but he appears to have had the advantage of working for an authorized dealer. I tried to price out new gear on my own, but couldn't find any way to get everything for less than about $400. The shopping list is actually quite simple, consisting only of a Mi Casa Vera VeraLite home controller (~$180), an IR blaster, and 4 Z-Wave switches (~$50/each). The challenging part of this project is in the software setup, which relies heavily on a few other apps. Tasker is at the core of the operation, along with a pair of plugins: AutoVoice, which is used to accomplish the voice command portion of the interface, and AutoRemote for passing messages back and forth with a Google TV unit (also running Tasker). 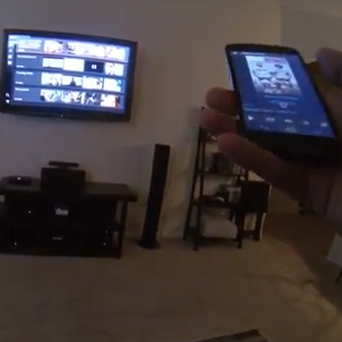 A separate computer running XBMC is operated with Yatse, and directions for the Mi Casa Vera controller go through an app called AutHomationHD. The total price for unlocked/pro versions of these apps will come out to just over $10, which is very reasonable for the potential usefulness. Unfortunately, setting up is a bit more daunting and requires several Tasker profiles to catch various phrases and keywords. This system obviously involves a lot of custom configuration and may be pretty complicated for somebody starting from scratch, but it is a great demonstration of what can be done with just a few simple tools. While Tasker and AutoVoice are important for driving the voice interface, almost everything else can be replaced to fit the situation. Just think, when Walt Disney started working on the House of the Future, I doubt he ever imagined people would be able to build something like this with a little spare time and ingenuity. If you would like to dig a bit deeper and start a project of your own, take a look at the discussion on Reddit.